Edmund Spenser. “The Shepheardes Calendar” (1579). 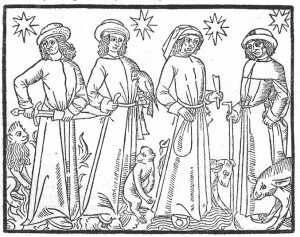 The four strapping lads depicted in this highly descriptive woodcut represent the four humoral temperaments. From left to right they are the choleric, sanguine, phlegmatic and melancholic humors respectively. By the time this woodcut was carved this theory of human temperament had held sway for many, many centuries. It was the dominant theory of Physiology, Psychology and Medicine until the 17th century with parts of it surviving within these disciples until fairly recent times. To this day our language remains peppered with humoral expressions. We have all met people who have a dry sense of humour or others described as a wet blanket. We know the difference between a hot headed individual and a cold blooded one. There are countless other commonplace expressions that spring to mind. These phrases are the legacy of the once commonplace and universally accepted humoral theory that defined our individual temperament. Our temperament informed others of the way we would act and react in various situations and it described our susceptibility to specific illnesses, physical and mental. Each one of us has our own astrological temperament that was dictated by our specific humoral balance. The humours were associated and governed by a planet. We are reminded of this fact by the lovely, childlike star just above each man’s head. This visual metaphor for the heavenly, spiritual world being reflected onto our earthly plane helps us to understand the traits of each temperament via a planet’s intrinsic humoral nature. In the past there was a belief in a cosmic sympathy that permeated all matter, animated or otherwise, held together by a divine universal spirit. Everything in the celestial and sub-lunar realm was connected to and influenced by everything else. Each temperament was ruled by one of the four classical elements of fire, air, water and earth and it was commonly understood that they existed inside the body as fluids known as Humours. Least we forget which man is which, if you look at the bottom of the picture you will note that each man stands upon the elemental base associated with his specific humoural type. On the far left is Mr Choleric standing upon a base flames that are leaping upwards. This represents the element of Fire which corresponds to the humour of Yellow Bile. Both are hot and dry in nature. Yellow bile was thought to have its seat in the gall bladder and it had a bitter taste. It was ruled by mars. Next comes Mr Sanguine on a base of clouds representing the element of Air which corresponds to the humour of Blood. Both are hot and wet in nature. Blood was thought to contain the other three humours, carrying them around the body to be distributed. It had a sweet taste. It was ruled by jupiter. Mr Phlegmatic stands upon waves representing the element of water which corresponds to the humour of Phlegm. Both are cold and wet in nature. Phlegm was believed to have its seat in the brain and have a salty taste. It was ruled by the moon. Finally, on the far right of the picture Mr Melancholic stands upon a foundation of solid earth which corresponds to the humour of Black Bile and both are cold and dry in nature. Black bile was believed to have its seat in the spleen with a sour taste. It was ruled by saturn. Note the exact horizontal division in this woodcut that is indicated by the alignment of each man’s waist. It effectively splits the picture into two parts. The more divine, intellectual part of man’s nature is represented by the top half of the picture which is nearer the sky and heaven. The part that represents our lower bestial nature is on the bottom half of the picture which is closest to the ground where the beasts dwell. The four elemental men are not alone and each is accompanied by an animal traditionally associated with the humor. Although there are other animals associated with each humor (e.g. the melancholic humour is also associated with the owl) for the purposes of this post I have chosen to use this particular woodcut. These animals will give us clues as to the behaviour and nature of each of the men they are assigned to. As stated, the animals are in the bottom half of the picture and near the earth. This tells of our basic bestial drives and nature. The sanguine man is different from the others for he has two beast associated with him. One is in the upper half of the picture near the heavenly realm and speaks to us of our of our mentality and higher nature. The other isn’t. The lion’s fiery mane is reminiscent of the sun and its rays. It shows intellectual victory over our bestial nature, a good use of our vitality and strength. This is the good side of choleric temperament. A golden lion is the colour of the sun and noble by association. The lion is traditionally the king of beasts, strong and valiant, calm and contented. But the lion hints at the terrors of a darker more, tempestuous side found within the choleric nature. Just like the lion this man can be fidgety, restless and aggressive, quick to anger with a possible savage side. The lion warns of a bloodthirsty nature that kills without remorse with its teeth and claws as sharp as any dagger or sword. The monkey is human like and linked to our inquisitiveness and curiosity about the world we live in. It seems human but isn’t. Monkeys are adaptable and dexterous, good at mimicking and copying – monkey see, monkey do after all. They are amusing, entertaining and chatter in a way that is reminiscent of human speech. For all the aforementioned reasons monkeys have been linked with intelligence throughout the ages. With a playful, energetic way of behaving which makes them tricky to catch or pin down, they are symbolic of an opportunistic nature and duplicity in all forms which includes sexual duplicity. But all these traits and antics belie their total lack of human understanding. Almost human but not human, we are warned to be on our guard in our dealings with the sanguine man. The falcon is a creature of the air and signifies acute perception, discernment and freedom as it flies high above the earth. It is all seeing, superb at hunting, homing in on its prey with deft precision, a symbol of victory perched on the sanguine man’s left hand – the more passive side of our nature – ready for action at a moments notice. This reflects the mind of its owner, constantly on the lookout. For although the sanguine man appears to be the calmest of the four men his mind is sharp and never at rest. It can instantly spring into action just like the falcon. The falcon can also symbolise cruelty for it focuses its energies and attributes on the killing of less agile and aware animals. Sheep are passive animals and need to be protected. Shy, gentle and timid in nature they are easily frightened. Since they flock together they are regarded as lacking individuality giving them the reputation of being easily led or even stupid. The ewe is regarded as a passive and harmless animal and the lamb is a very ancient symbol of innocence and vulnerability. Sheep have been used in sacrifices since the earliest of times. The ram however is seen as something completely different. It is a symbol of vitality and unwavering determination. The ram’s horns are effective weapons and their spiral shape remain a symbol of eternity: birth, life, death and rebirth. Sheep are sure footed animals with an innate and excellent sense of balance being good at jumping and climbing. In this respect they were thought to make the best of any opportunities. Sheep are also contented animals. Happily eating the grass beneath them they quietly graze and gently get on with life in their own calm and peaceful way. Peace and calm are the qualities they are renowned for and the image of sheep, jumping over a fence one by one, is reputed to induce sleep. This peaceful nature is what makes the phlegmatic type a good friend to have. They do not jostle and shove and can happilly accept guidance from a more authoritative figure but the phlegmatic type can be guided in the wrong direction. Pigs (and wild boar for that matter) have been a symbol of abundance and fertility since ancient times for there are normally many piglets in a litter and they are tough and resilient animals. They were regarded as a great commodity in the past and readily bartered at markets. Farmers who kept and bred swine were always known to have lots of food. This association of abundance remains with us with the china ‘piggy bank’ being a worldwide symbol of money. Pigs are intelligent animals but they can be ferocious too. The wild boar is a very good hunter of food and can be dangerous if crossed. In the modern world an ambivalent symbolic meaning that is completely at odds with ancients beliefs has emerged. These contented and sedate animals, their eyes downcast towards the earth, are unconcerned with heavenly matters and they happily forage and snuffle in the earth looking for food. They also spend time cooling off in the mud. As a result they have become regarded as unclean and lazy by some cultures. Pigs are omnivores, undiscerning and will eat almost anything that comes their way. They have a voracious appetite so over time the pig has became the symbol of laziness, greed and ill-manners.